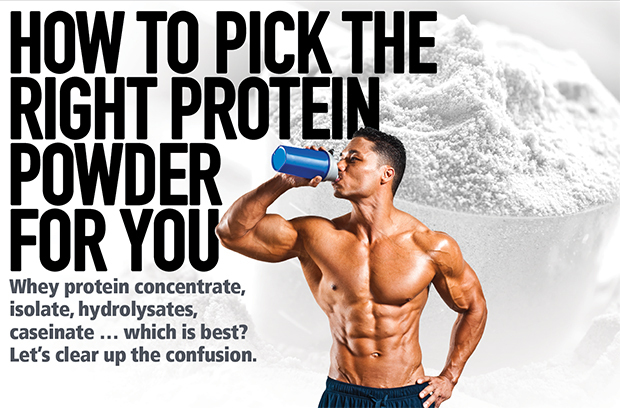 Whey protein concentrate, isolate, hydrolysates, caseinate … which is best? Let’s clear up the confusion. Protein powder is one of the most popular supplements used by athletes and weekend warriors alike. No wonder, because it plays an essential role if you’re looking to optimally burn fat or build muscle. But have you ever wondered how it’s made and how the various types of proteins—including whey protein concentrate, isolate, and hydrolysates—are different? After briefly exploring the process for producing commercial protein powders such as the ones you see in your favourite supplement stores, we’ll explain how the products are different, and how to choose one that fits your goals and your budget. Protein powders are a highly processed and dehydrated form of protein that can be reconstituted back into a liquid form simply by mixing with water or another beverage to form something you can drink (e.g., a protein shake). They’re used for various purposes outside of bodybuilding, but within the sport, protein shakes are used primarily as a convenient way to increase protein and overall caloric intake. Generally speaking, the powdered shakes are supposed to give you all the benefits of a protein-rich food source with added convenience and portability. The most common forms of protein found in sports-nutrition stores are whey proteins and milk proteins (caseinates), which are all derived from cow’s milk. In addition to milk, whey, and caseinates, you may see some protein powders that contain non-dairy forms of protein such as soy, egg, rice, or a blend of vegan proteins. These proteins absolutely do have a place as dietary supplements and foods but generally speaking, they’re inferior to milk, whey, and casein as sources for use in bodybuilding and fitness. Because these protein sources are incomplete, meaning they’re missing one or more essential amino acids, I recommend avoiding them unless you have an allergy, for example, to milk proteins or are a vegetarian. You can’t build muscle most efficiently if you’re missing some vital components. Whey protein is a high-quality protein naturally found in milk. It’s completein the sense that it contains all of the essential amino acids required by the human body, plus it’s easy to digest. Whey protein is also one of the best sources of branched-chain amino acids (BCAAs), especially leucine, which has been shown to stimulate muscle protein synthesis. Interestingly, even as little as 10 grams of whey protein (combined with carbohydrates) has been shown in clinical studies to stimulate the rebuilding of muscle when consumed immediately after exercise. All whey protein comes from dairy farms since it’s naturally found in cow’s milk. Two or three times per day, cows are brought into a specialized area called a milking parlor, where the milk is collected using large hoses with suctions. The milk collected is then transported to a manufacturing and processing center in metal tanks that store up to 50,000 gallons of milk. Upon arrival, the milk is tested to ensure it’s free of salmonella, pathogens, and other dangerous microorganisms. Whey protein is one of two major proteins found in cow’s milk, with about 20 percent of the protein found in raw milk being whey protein. The whey portion of milk is separated and diverted to an area where cheese is produced. This process begins by adding certain enzymes to the milk that causes it to separate out into its constituent parts. One of the parts is a milk solid called curd, which is used to make cheese. But what’s left behind when this curd is removed is whey protein in a liquid state. This liquid whey is then pasteurized and dried into a powder for various uses. Some examples of processing methods you may have heard about include microfiltration and ion exchange. Whey Microfiltration. This method uses fine specialty filters to strain the protein into smaller constituents. The filters are called microfilters (or ultrafilters) because the size of the holes (pores) of the filters are microscopic. This is a physical means of removing the valuable protein portion from the rest. Ion Exchange. This is another method utilized to concentrate and purify whey protein. The protein is placed into an ion-exchange tower and undergoes a chemical purification process. Typically, two chemicals are used in this process: hydrochloric acid and sodium hydroxide. Ion exchange is usually less expensive than microfiltration, but it also denatures some proteins and some of the amino acids. Some of the affected molecules can include immunoglobulins and glycomacropeptides (which may improve calcium absorption and boost immune function). However, most of the contents are left intact, and this process will not affect most people who consume products containing whey protein one way or another. Once the protein has been concentrated, it’s then placed into a drying tower to remove the remaining water. The final step is to package the protein powder into various-sized containers (up to 1,000 kilograms) before the product is shipped to distribution centers. There are essentially three types of whey protein: whey protein concentrate, whey protein isolate, and hydrolyzed whey protein, which are the highest quality sources. Whey Protein Concentrate (WPC). Many of your favourite whey protein-powder supplements often list whey protein concentrate on the label as the first ingredient. The amount of protein in whey protein concentrate can vary from 25 to 89 percent. In sports nutrition, the most common type of whey protein is 80 percent protein (abbreviated WPC or WPC80). But this product isn’t purewhey; the rest consists of lactose (4 to 8 percent), fat, minerals (ash), and moisture. Whey Protein Isolate (WPI). Whey protein isolate (most typically abbreviated WPI or WPI90) is the lowest carb and lowest fat form of whey protein, containing 90 to 95 percent protein. It’s an excellent source of protein for people who are lactose intolerant or those looking to cut fat and carb intake as it contains almost no lactose or fats. The price of WPI products is significantly higher than WPC because of the higher protein content. But this doesn’t mean this is a higher quality protein as it’s still the same as whey protein concentrate, but a lower-fat/lower-carb version. Hydrolyzed Whey Protein. This is made when the relatively large protein polypeptides in the whey protein isolate have been processed to break down the polymers into much shorter chains (e.g., di- and tripeptides). This allows the whey protein to be digested and absorbed much faster in the intestines and may reduce the potential for allergic reactions. Hydrolyzed whey protein is expensive, has a bitter or acidic taste, has an ammonia smell to it, and must be specially treated to allow it to be soluble/mixable in water and other beverages. This type of protein is most often found in baby formulas and specialized medical-nutrition products. All hydrolyzed whey proteins are faster digesting than non-hydrolyzed milk proteins (which are generally 70 to 80 percent casein and 20 to 30 percent whey protein), as well as pure caseinates. This makes whey ideal for post-workout recovery and perhaps less well suited as a “before bed” type of protein, as we’ll see below. Casein is the main protein found in cow’s milk, making up to 80 percent of the protein (between 20 and 45 percent of the proteins in a human mother’s milk). Casein is responsible for the white appearance of milk. It’s naturally combined with calcium and phosphorus as clusters, which are known as micelles. Casein has a wide variety of uses outside of sports nutrition; for example, it’s a major component of cheese, it’s used as a food additive, and it’s even used as a binder for safety matches. When used in foods and protein powders, caseins supply amino acids, small amounts of carbohydrates, as well as calcium and phosphorous. An interesting property of caseins is their ability to form gels or “clots” when exposed to acids such as those found in your stomach during digestion. This unique property makes caseins very efficient at supplying amino acids. The gel is able to provide a sustained or slow release of amino acids into the amino-acid pool, which can last for up to eight hours. This usually provides superior nitrogen retention and use by the body, helping you avoid catabolism. There’s also some evidence that caseins lead to higher IGF-1 levels both during and after ingestion when compared to other proteins. Therefore casein-based products are probably better suited as between-meal snacks and before bed to help bodybuilders elevate circulating amino-acid levels and help maintain an anabolic state. Caseins are produced by means of large centrifuges that produce cream, which is a component in the manufacturing of butter, whipped cream, or other milk-fat products, as well as skim milk. Skim milk can thus be considered as the raw material from which caseins are made. The skim milk is acidified to produce acid casein, which is then separated from the whey. It’s then washed and dried. Water-soluble derivatives of acid caseins, produced by reaction with alkalis, are called caseinates. Most caseinates (such as the very popular calcium caseinate, which is in many protein powders) will contain over 90 percent protein and almost no lactose or fat. This protein is around 95 to 98 percent soluble in water (sodium caseinate is virtually 100 percent soluble in water) and are usually less expensive than whey proteins, making them perfect for use in protein powder. Caseinates tend to have a chalky appearance and taste, and they’re low in lactose, which makes them very well suited for people who are lactose intolerant.